When it comes to dairy, you always want to buy organic or make it at home yourself. I am currently half way through my Food Babe way book and I’m learning more and more about exactly why conventional milk is terrible for us. Did you know that non-organic dairy is polluted with genetically engineered recombinant bovine growth hormone (rBGH)? This drug increases a cow’s milk production by over 10%, but in return, increases our risk of breast, colon, and prostate cancer. Unless your milk is clearly marked “organic” or “rBGH Free” it probably contains this hormone. Because this additive is so harmful, the cows udders become inflamed which then requires even more antibiotics be given. This, as you can imagine, is bad news for us, as these hormones and antibiotics stay in the cow’s milk that is then placed into the grocery stores we shop at. Because I refuse to drink dairy, or even store bought nut milk (because of its carrageenan or gums), the only way I drink milk is to make it myself. Here are some of the other disturbing ingredients that cause me to further avoid store bought milk. Carrageenan– This ingredient is derived from seaweed so at first it sounds safe, however, Carrageenan is an inflammatory agent that could be to blame for your bloated tummy. Ever get a stomach ache after eating ice cream, dairy or almond milks? Probably this to blame. With links to gastrointestinal problems and colon cancer, Carrageenan should always be avoided, but be warned- it’s in everything. Yogurts, cream cheese, whipped cream, deli meats and more, this is one tough ingredient to avoid so be sure to check your labels! Xanthan Gum– Xanthan gum is a largely indigestible polysaccharide that is produced by bacteria called Xanthomonas Camestris. A bacteria? Gross. It’s no wonder that this ingredient has serious links to unwelcomed bathroom issues. One study had volunteers consume 15g of xanthan gum per day for 10 days, in which they found xanthan gum to be a “highly efficient laxative,” and subjects experienced greater stool output and gas. Guar Gum– Not considered a carcinogen, but studies do show Guar Gum causes an increased risk of gastrointestinal issues and abdominal discomfort. Many also have an allergy to this, causing them to break out in a rash or experience an extremely flaky scalp. Gellan Gum– This gum is very similar to Xanthan Gum, as it also produced by bacterial fermentation. Many complain of the same stomach aches and pains after consuming this, and when it was fed to rats it resulted in abnormalities in their intestinal microvilli. So, now that you’re hopefully ready to kick store bought milks goodbye, here is how I make my own instead. It is more work than just picking one out at the store, but if it can heal your dry scalp, eczema, rashes, acne, and bathroom issues, I would say it’s worth the extra work if you asked me. Soak the cashews in water at least 4 hours, or overnight in the refrigerator. Drain the cashews and rinse until the water runs clear. Add the cashews and two cups water to a blender. Start on a low setting and increase the speed until the cashews are totally pulverized. This could take 2 minutes in a high-powered blender or longer in a regular blender. Blend in 2 cups more water, your sweetener of choice, vanilla extract, sea salt and cinnamon (optional). If your blender can’t totally break down the cashews, strain the milk through a fine mesh strainer or cheesecloth. Store the milk in a covered container in the refrigerator. It should keep for 3 to 4 days. 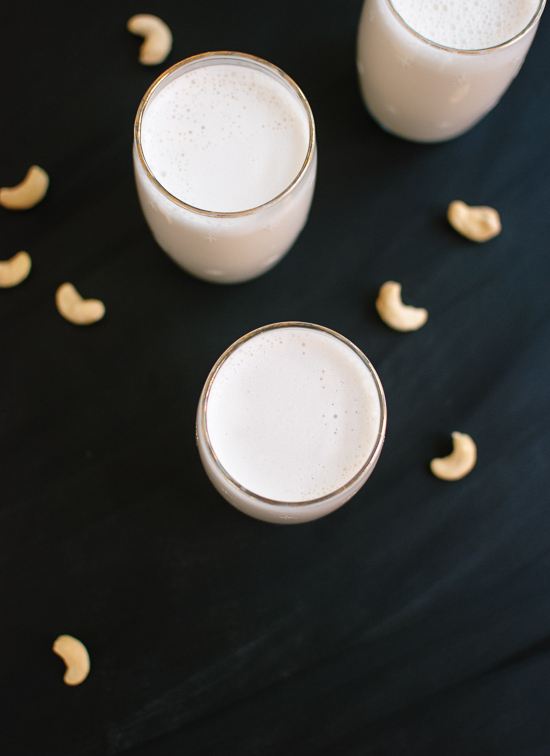 The ratio of water to cashews (4 to 1) in this recipe yields milk that is somewhere between 2% and whole milk in terms of creaminess. Use less water for even creamier results. All gum research by Chris Kresser and The Food Babe! Cashew Milk recipe by Cookie & Kate. The post How to Make Nut Milk at Home appeared first on Organic Bunny.